Beautiful Oceanfront 3 bedroom, 3.5 bath townhouse is over 2000 square feet and located on a cul-de-sac in a gated, private community. Steps from the community pool and boardwalk to the beach. Downstairs patio and upstairs balcony provide breath taking ocean views. Private two car garage leading into the laundry room and kitchen. Beach chairs, beach toys and floats are there for your use. Limited number of beach towels provided. New flooring and paint throughout. Full width of unit patio/balcony on 1st and 2nd floors. Fully furnished kitchen. Premium cable and wifi. TVs in all bedrooms and living rooms. Fireplace with electric fire logs. Washer and dryer. Sleeps 9. 3 queen beds, 1 full bed. 1 twin sofa bed. 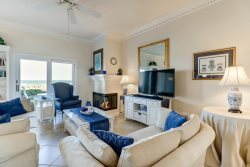 The owners of this condo are members of the private Golf Club and Beach Club of Amelia Island. Not all property owners are members of this exclusive resort and club. Guests of this unit can enjoy access to these resort amenities which include: the private and gated Beach Club of Amelia Island, the oceanfront pool, Beach Club bar & grill, lighted tennis courts and access to the beautiful ocean front golf course at the Ritz Carlton (at significant discounts to standard greens fees). Amenity Card fee $110 plus tax. Weekly rentals are Saturday-Saturday only from June 1 – August 10. Master suite with queen bed, bathroom includes garden tub and walk in shower. Guest room with 1 full bed and full bathroom, 2nd guest room with 2 queen beds, one pullout twin sofa in spacious sitting area with full bath. Half bath downstairs by kitchen.